As disillusioned citizens across the planet take to the streets, do you wonder if the world’s nation states will ever get it right? Will they ever assemble and enforce enough rules and regulations to bring peace and harmony to humanity? Does anyone really think that politics is working--aside from those in power and behind it? What if living together in peace and harmony is a more natural condition than that we experience in today’s conflict-driven culture? We are community animals with built-in empathy, good at organizing things and helping each other out. The most essential and reliable features of our culture arose without top-down planning by a state that has one basic objective--to stay in power. We have enjoyed enduring civilizations in the past governed wholly from the bottom-up, without need of a shepherd and sheepdogs. We can do it again – and are more connected than ever before. The State Is Out Of Date reassures us that politics is not even the primary game in town, though it sometimes may seem like the only one. 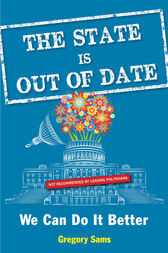 It is a book for all those who wonder why politics isn’t working and what would. Gregory Sams has been changing the culture from the age of 19, when he co-founded SEED, the UK’s first natural and organic restaurant in 1960's London. It led to Ceres Grain store, where customers could buy these foods to cook at home. Within a few years he had created the nation's first natural and organic food enterprises, including Whole Earth Foods. He was founder publisher of Harmony Magazine, to which John Lennon dedicated an eight-frame cartoon, and co-published Seed, the Journal of Organic Living. In 1982 he created and christened the original VegeBurger, initiating the market for vegetarian food. In 1990 he founded Strange Attractions, the world’s only shop ever dedicated to new science “chaos theory.” His interest in that science planted the seeds of this book in Gregory’s mind. Visit Sams at gregorysams.com. He lives in London.